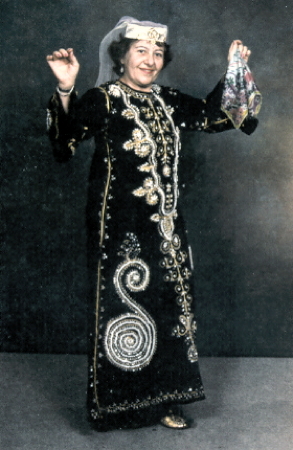 Information: Frances Ajoian (Schleadewitz), teacher and author of Armenian dance. Frances was born to Armenian parents who immigrated from Antab, Turkey, around 1922. She lived with her mother after her father's death in 1952 until her marriage in 1959. For twelve years, she worked as a secretary, then went into insurance underwriting. She is a member of the Armenian Congregational Church and the Armenian General Benevolent Union in Fresno, California. She learned to speak Armenian and Turkish from her parents and later learned to write in Armenian. In 2002, Frances started folk dancing with local Fresno clubs in 1950. A year or so later, she was asked to form a group to put on an exhibition of Armenian dances at an October Raisin Harvest Festival, hosted by the Fresno Folk Dance Council of the Folk Dance Federation of California. Although she had long been interested in Armenian folk dancing, this was the start of her serious efforts to do research in the field. She asked various young people at the Hye (a word Armenians have for themselves) doings to join her in learning Armenian dances. She made arrangements to rent a hall, bought a phonograph and records, learned two Hye bars (Armenian dances), and taught them to her new students  thus beginning her teaching career. She named the group the Cilicia Dancers. Her research into the Hye bars started with attendance at every Armenian function that was happening. She joined every line of dancers, and asked musicians who played for these functions for material. Afer a year of hard work with her students making their own costumes, they were ready for an exhibition of an Armenian medley and presented it at the October folk dance festival, dancing to live Armenian music by J. Aslanian and his group. 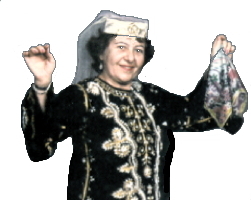 In 1954, Frances was invited to teach a few of her Hye dances at the Stockton Folk Dance Camp at the University of the Pacific in Stockton, California, returning in 1955, 1956, and 1957, and has been teaching Armenian folk dances to appreciative folk dancers ever since. Armenian Bar Dances, Fresno, California, Sierra Printing & Lithograph, 1961. Armenian Dances, Fresno, California, Self-published, 1996.